Excellent recipe! I love pea shoots in salads and cooked like this – such a subtle pea flavor. Those ramps look more like wild leeks (Allium tricoccum) rather than what I know as wild garlic (Allium ursinum, more commonly known as ramsons). I wonder if there is a taste difference? Ramsons are very pungent and a little goes a long way. Interesting about the ramps…I was questioning it myself. I bought them at our Asian market and took a double look at the labeling because although I thought wild leeks it was clearly marked wild garlic. These were very mild and I actually used all the amount you see on the chopping block for this recipe and it was not overpowering. I’m thinking you are right…wild leeks. Should I change the post title? I think ramps are also sometimes referred to as wild garlic, so you really don’t need to change the title. I’ve seen ramps referred to as wild garlic in at least one other post recently, but your photo was the best closeup I saw of them and was able to compare with what I have here. I’d love to try ramps and will look in our local Asian markets for them. I wonder what they will call them? I think this ramp is actually garlic chives (from wiki here: Allium tuberosum, commonly known as garlic chives, Chinese chives, Oriental garlic, Chinese leek, also known by the Chinese name kow choi also transliterated as gau choy), the leaf is much narrower than wild leek or garlic, and if you bought them from Asian shop, it must be this one I think. I use it for Chinese dumpling and Korean pancake. It is sunny and warm here for a few days, somen sounds like a good choice for dinner! Soba noodles are my new favorite food, love the flavor and texture. Sounds like you had a wonderful day off accomplishing things. Great dish! Hi Cheri. This was the first time in years I revisited somen noodles. It’s as if I had completely forgot about them. I love them too. Mostly in a soupy broth but this was very nice as well. Thank you! It’s so pretty! I think the enoki mushrooms are cute too :P And I see pumpkin seeds in your pesto! Not only are enoki mushrooms cute…the name is super cute too, right! Yes, pumpkin seeds are my new favorite seed. I love them roasted with a little salt and tossed on top of a salad for lunch! I bet you have pulled off some pretty amazing “on the fly” meals Nancy. I couldn’t count how many have failed though. Even when I took the photo I still wasn’t sure if I was going to post it. I thought the noodles were going to be too sticky. I was very pleased it turned out so well. This looks so delicious! Ramps and pea shoots… two things one cannot find here in France, so I can only dream of your beautiful dish (or finds ways of replacing them). Such beautiful pictures too! I have never cooked with ramps, but this sounds very interesting. Must have tasted awesome! Sonal! :) It really was an awesome dish. I didn’t expect it to be so good since I kind of threw it together. A pleasant surprise. Wow you are an amazing chopper. What gorgeous photos. I know what you mean about “days off” (quotes intended). On my days off I mop the floors, do two loads of laundry, clean the bathroom, etc. This dish is so so beautiful. 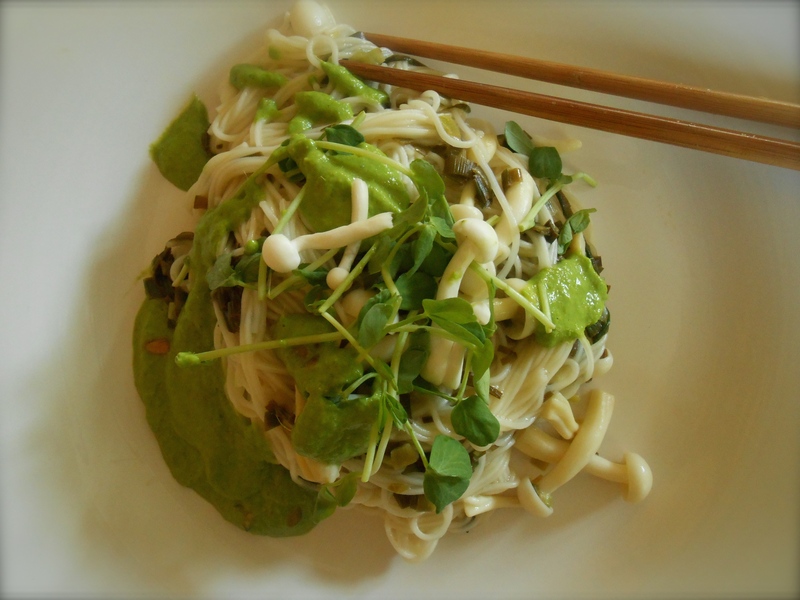 The mushrooms, noodles, lemon..and RAMPS. I also love peas shoots. The pesto is beautiful. So redolent of spring. I wish I could have some now. Awww. if I only had two loads of laundry a week! :) Actually maybe I should make those guys do their own…right! I’m such a push-over. We always refer to our days off work as days on around here. It’s unbelievable the amount of work we have in progress right now. We are remodeling this old house and we have been in a state of construction for days! Weeks actually! But, it doesn’t take much to convince us to break away and head out for some fun! That sounds like a lot of work but it shows you care. At least your laundry is in the house. In nyc we have to trek to the next building. However that wouldn’t fly if/when we have kids. Pea shoot pesto… Now that sounds like a damn fine idea!! How divine. I’m trying to work out what ramps might be. We probably call them something else over here. They look a little like our garlic chives. Love the look of the pea shoot pesto. I’m not sure other than wild leeks or wild garlic. 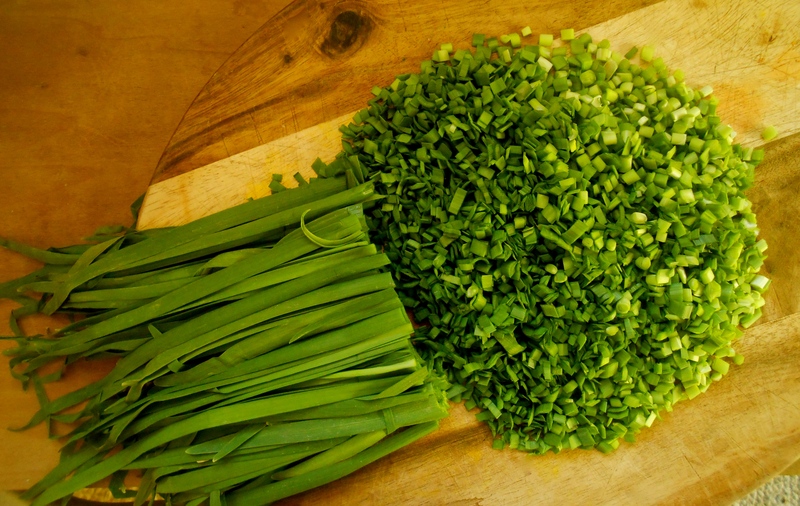 The leaves are very tender and flat unlike a green onion (scallion) or chive, which are tubular. And the flavor is much more mild than scallions too. I’m wondering if garlic chives are also known as garlic scapes. Argh. So many variations. It’s fun to try to pin it down though. Spring on a plate! Not sure if we have ramps or what we call them, is the flavour similar to young leek? I’m wondering if you have ramps available in Oz. I am thinking the flavor is similar to young leek. 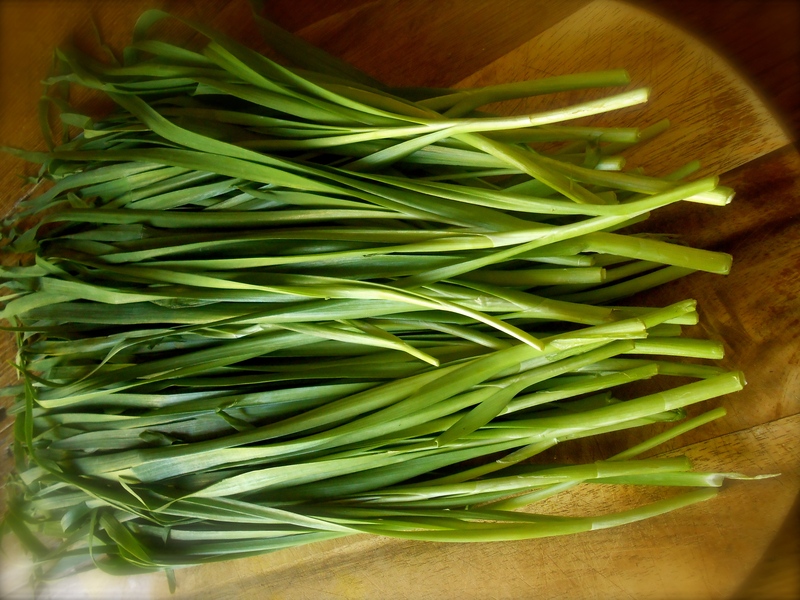 The green part of the ramps are very tender and edible as well as mild. And honestly, I’m not sure if I have ever had young leeks. Only the larger tougher leeks. Spring on a plate for sure! It looks so fresh and compelling! Beautiful! Oh, how fabulous that looks Seana. So fresh! Just my kind of dish. Thank you Lidia! :) It’s great to see your presence lately. Really! I missed you. OMG! I go on walk-about for a few months and now, look at your photos! They were good before, but, youzza, momma, they look stunning. Please send bowl of noodles STAT. OMG is right because it’s great to see you! Hopefully you are posting again, would love to see what you’ve been up to. :) Thanks for saying hi! So glad you said “hello” back. I missed so many of you. Just posted something chocolatey. Working on a few other things. You know how it is. Amazing recipe, the very essence of Spring. So fresh and healthful and seems quick and easy too!! Hi Suzanne. Quick and easy for sure. I think I spent more time thinking about the outcome than I did actually preparing it. :) You know what I mean don’t you! I love how your mind works, Seana! I buy food just because it’s cute, too :-) Looks tasty and colorful and satisfying. Great way to welcome spring. Those ramps are stunning. Cute food is a must! I can’t think of too many things I consider cute other than enoki mushrooms. I mean even the name is cute. Well, baby corn is pretty cute too isn’t it? 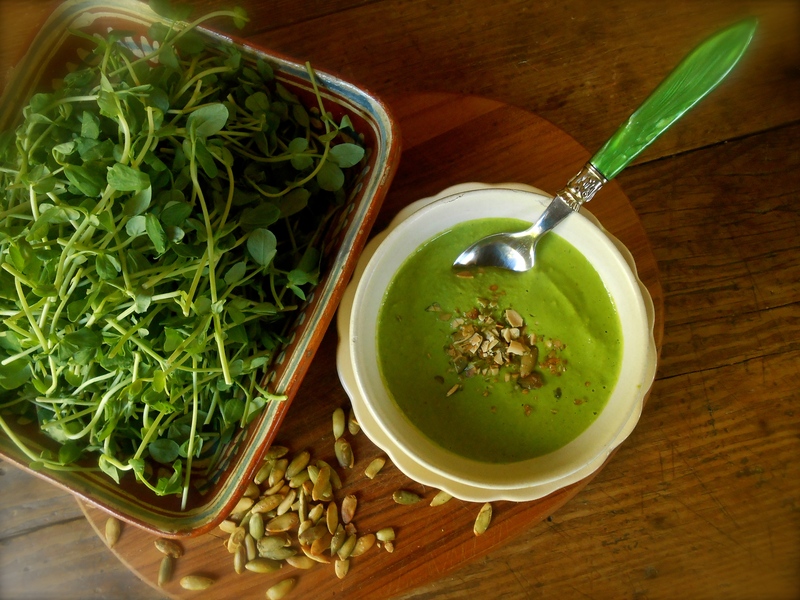 Here’s to accomplishing things at home and spring and ramps and pea shoots! Bravo! Here here! It’s enough to clink and tip for sure. I’m beginning to think we are over the hump on spring over here. We had a few 80°F days this week, should start seeing the summer vegetables soon. Thank you! :) Enjoy the weekend. Thank you Patty. How’d it go? Aren’t enoki mushrooms fantastic! I love them. Yes, I love all mushrooms with the exception of shiitake mushrooms. I can’t stand them for some strange reason?? Hi there! Sometimes I sit pretty still on my days off. That one happened to be very productive. Like tomorrow, I’m off and believe me….I plan on being off! I’m with basil &butter on this one, second in line for the adoption please. That meal looks so fresh and green that it almost hurts the eyes with gorgeousness! Hahaha! Wish we could all just get together and enjoy some good home cooked meals together, now that would be fun! Thank you Luffy. That wild garlic is absolutely gorgeous! And I have never met a pea shoot I didn’t like. Our peas here are finally starting to flower and pod up (is that a term?). Thank you for the spring-time inspiration! I’d say pod up is proper english! :) I knew exactly what you meant so it is acceptable. I’m glad you’ll start reaping the rewards of the pea harvest soon, that is a very special time of the year, isn’t it! And hopefully you’ll come across some ramps too! They are so wonderfully mild and delicious. Thank you so much. :) And for stopping by this weekend! Thank you so much for nominating me for two awards! Very kind of you to think of me…. I adore pea shoots, and am sure that this pesto must have been excellent, especially when used with the other ingredients in this dish. Thanks for sharing. Is this all in Seattle? or are you nearby? I’d love to make a trip up there with my Larry and visit all the food places I’ve read about! I was wondering how beautiful and creative are your recipe! The pea pesto sounds amazing, thanks a lot for sharing with us! This looks fantastic. Spring in a bowl! I just love that photo of the ramps partially chopped! Oh, and pea shoot pesto sounds fab. I actually managed to find pea shoots recently, in a bag with salad leaves. Very nice. 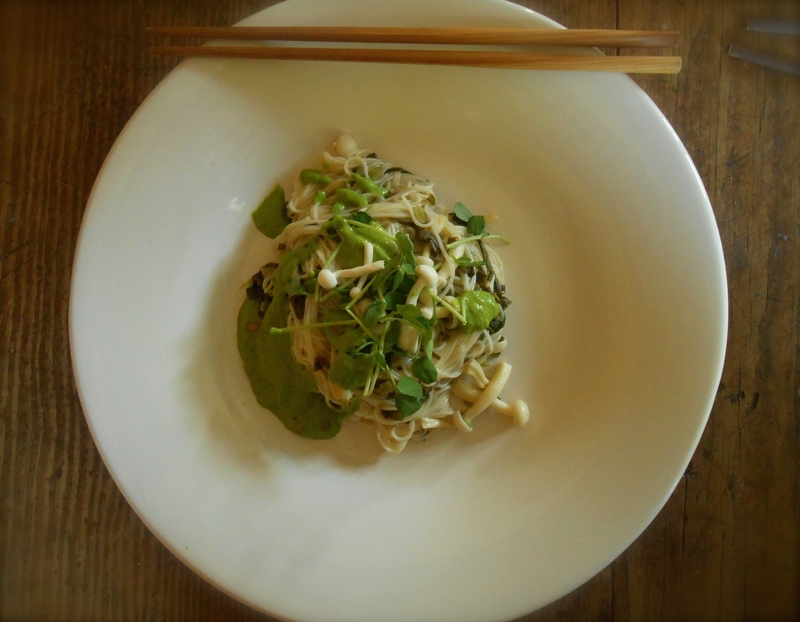 You are currently reading somen noodles with wild garlic & pea shoot pesto at COTTAGE GROVE HOUSE.